Operator Zak Smith with a new 3156G John Deere swing machine. Photos courtesy Bighorn Logging. For Harve Dethlefs, president and founder of Banks, Ore.-based Bighorn Logging Corp., logging has been part of his life since he was a child. Growing up riding in a cab with his father, who was a logger like his father before him, logging seemed like the obvious career choice for Dethlefs. But Dethlefs’ route to logging was unconventional. After graduating from high school and serving in the military, Dethlefs began driving trucks in Portland, Ore. He then moved to an electronics company, working in the warehouse as the working group manager and then warehouse manager for 18.5 years. In 1981, Dethlefs retired – but not for long. At 43 years old, he wanted to get back into the woods and follow his father’s footsteps. Bighorn Logging began as a contract cutting business with two employees, transitioning to clearcutting after a year and a half of operating. The company has been expanding ever since, and now employs 80 people, who work eight to twelve hours a day at least five days a week, year-round. While not yet officially retired, Dethlefs says he is close to doing so. He jokes that the main reason he comes to work every day is to check up on his partner, Mark Standley, Jr., Bighorn’s vice-president, who joined Bighorn 14 years ago as a hook tender. Over the years, Dethlefs has seen the industry go through several ups and downs, and knows just how important it is to have the right machines. Dethlefs’ first machine was a 599 American, but he quickly replaced it with a GT3 Skagit yarder. At the time, Bighorn was clearcutting for Longview Fiber, a local company. As they picked up more work, the GT3 Skagit yarder became tired. Consequently, Dethlefs switched to Thunderbird yarders, starting with a Thunderbird 255 swing yarder. Bighorn eventually acquired five Thunderbirds, which they still use today. “Thunderbird is not in business anymore so, frankly, ours are getting fairly old, but we keep repairing them, making them work because there’s nothing on the market that we feel is equal,” Dethlefs says. Such brand loyalty is also evident in Bighorn’s commitment to John Deere forestry equipment. In fact, CFI met with Dethlefs and Standley at John Deere-Hitachi Specialty Products (DHSP)’s Langley, B.C. factory for a special event commemorating DHSP’s 5,000th swing machine. Bighorn Logging, now the proud owners of the 5,000th swing machine, has 27 John Deere machines, including a grader, front-end loader, a 1050 dozer, multiple 2954D swing machines and three new 3156G swing machines with Southstar heads. Bighorn also has a Hitatchi 310 and Cat 568. But why is Bighorn so loyal to John Deere? “We try to stick with the latest technology on the market, that way we can stay ahead of our competitors,” Standley adds. With such a large fleet of machinery, Bighorn can work on six to eight sites simultaneously. 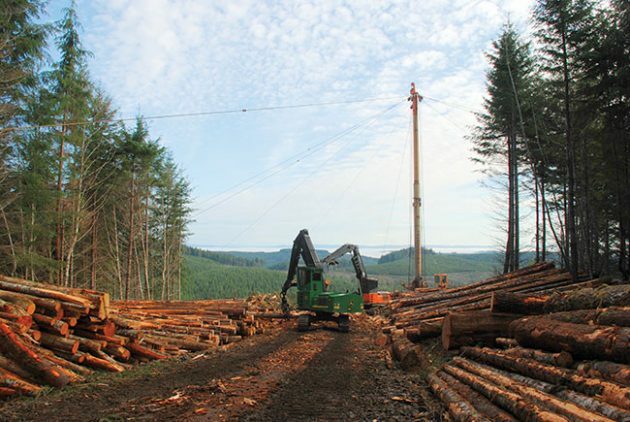 Over the years, they have worked for almost every timber company in their local area, including Stimson Lumber, Boise Cascade, International Paper, Bell Lumber and Pole, McCormick Piling and Lumber Co., and Stella Jones. Their haul distance ranges from 15 miles to over 100 miles. Bighorn has eight Kenworth log trucks to haul their loads. Finding drivers is a challenge, Dethlefs says, so they hire 20 to 25 contract trucks to help out. Depending on demand, Bighorn runs five yarder sites and three or four ground sites. The company does cable logging, ground logging, mechanical cutting, and hand cutting and roadside processing all types of logs. Eighty-five per cent of their harvest mix is Douglas fir, with some additional hemlock, alder and cedar. Most of the timber harvested is between 45 and 60 years old, although if a mill buys timber from state-owned lands, the trees may be 80 to 90 years old. Bighorn’s average harvesting volume in the last three years was 72 mmbf or around 169,901 cubic metres. In 2018, the company logged 74 mmbf. Typically, they deliver eight to 10 loads of logs per day per side. Last year, they delivered an average of 55 loads per day, for a total of 14,491 loads. The company has a roadbuilding crew that operates during the dry period of the year – from April or May to September. The crew does all aspects of roadbuilding except rock crushing, which Bighorn contracts out. About 12 years ago, Dethlefs added another feature to his one-stop shop: biomass harvesting. He set up a company and purchased a Peterson Pacific grinder, with a Hitachi log loader feeding the grinder. “We did that for five years,” he explains. “It was going along fine, once the company was up and running. But what happened was the state of Oregon was providing tax credits for biomass, and about midway through, we lost that tax credit. Once we lost that, it was not profitable anymore. So, we sold our equipment and got out of the biomass business. “We were ahead of the curve,” he says, acknowledging that biomass has become increasingly profitable as the demand for renewable energy grows. (Left to right) Operator Lynn Smith in one of Bighorn’s John Deere 2954D swing machines, operator Cody Smith in a Z370-3 Hitachi with a 24-inch Waratah processor and a Thunderbird TY90 yarder. Despite Bighorn’s history of dabbling in different aspects of forestry, the company is now trying to scale down. But that doesn’t mean Bighorn will stop innovating and investing in new technology. 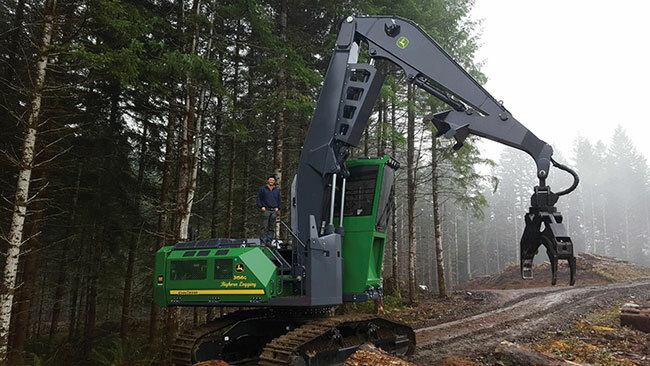 One way the company plans to scale down is by using steep slope logging equipment, which they recently began testing, renting equipment from a nearby logging company. Bighorn cuts on steep slopes with its John Deere 909 feller bunchers. Now, the company is tethering its feller bunchers and feeding the grapple. Bunchers on the hillsides place cut trees or logs into the yarder’s grapples when grapple yarding. The grapples come out into the unit via the yarder cables and then logs are hauled back to a landing. Steep slope logging will help Bighorn become more efficient by minimizing the number of employees on site and the number of roads they need to create, while also keeping operators safe. Given the cost of steep slope equipment, the pilot program will help Bighorn decide if it’s worth it. “When we get it all done, we’ll sit down and figure out the numbers, and if it’s positive, we’ll probably continue. Our goal is to buy our own equipment,” Dethlefs explains. Bighorn’s focus on new technology is not limited to steep slope equipment. The company recently bought a drone to string haywire – the small cable used to move big cables such as skylines when yarding with a cable yarder. A rope is attached to the drone, which is flown along a pathway to where the company wants its haywire. The haywire is then attached to the rope and pulled from the back-end of a unit to the yarder, at which point the skyline is attached to the haywire to drag it to the back-end of the unit again. Previously, employees had to walk across canyons, creeks and bluffs to string haywire from one end of a unit to the landing. Now, the drone reduces the time and cost of this. Interesting technology such as this also helps attract younger workers. Like many other industry players, this is the biggest challenge Bighorn faces. “We have a horrible time trying to get people who want to come into the timber industry,” Dethlefs says. “Pay is not really the greatest, conditions are horrible in the winter time. You’ve got to really want to be a logger to come work in our conditions. Looking to the near future, Dethlefs worries about the state of the industry. In order to remain profitable and successful, a number of challenges have to be addressed in the Oregon area. For Dethlefs, a big issue is the lack of open timberland for harvesting. The U.S. Forest Service has over 14 million acres of timberlands in Oregon, but he says these forests are not managed well, and contribute to wildfires. According to Dethlefs, the Bureau of Land Management also hasn’t met its mandate for volume of timber harvested annually. “If those two agencies would open up their timberlands to more harvest, there would be a future,” he says. But even if that happens, there’s a drawback: there aren’t enough sawmills to process the logs.